Should Scientists Be Looking for the Last Life-Forms on Mars? This image snapped by NASA's Curiosity Mars rover shows a series of sedimentary deposits in the Glenelg area of Gale Crater, from a perspective in Yellowknife Bay. The photo was taken on Feb. 14, 2013. Life may have lived and thrived in the oceans and lakes that once covered Mars — but some scientists want to focus the search for life on Mars on the organisms that held on when the water dried up: The last life-forms to survive on the Red Planet. The surface of Mars was once so abundant with liquid water that rivers, lakes, possibly an ocean, and maybe even hot springs decorated the planet's surface. The water of ancient Mars may have even been clean enough for humans to drink. Considering Mars' wet history, and its many similarities to Earth, scientists are actively seeking signs that life once existed there. The Red Planet may never have hosted plants or animals, but microscopic life-forms may have survived, even thrived, in that watery Martian environment 3 or 4 billion years ago. Alfonso Davila is a research scientist at the SETI Institute and the NASA Ames Research Center, who studies how microbial life survives in the Atacama Desert — the closest natural analogue of modern Mars on Earth. "There is an underlying assumption that if there was life [on Mars], it disappeared with the disappearance of water," Davila said. "But this is not necessarily the case." Davila said the discussion in the scientific community about searching for life on Mars has been focused on hunting for fossils preserved in sediments that were likely formed in the presence of water. He is submitting a paper for publication that pushes for a second approach, which is looking for the life-forms that survived on the Martian surface when most or all of the liquid water had disappeared. Davila's coauthor on the paper, Dirk Shulze-Makuch, a professor in the School of the Environment at Washington State University, presented the conclusions of the paper at the Astrobiology Science Conference in Chicago in June. Understanding how microbes survive in dry environments on Earth — like the Atacama — could give scientists very specific information about where to search for evidence of similar life-forms on Mars. Not only that, but those microbes could have been alive a few billion years after the lakes and rivers disappeared and the last sediment fossils formed. "You want to go to the freshest samples," Davila said. "So the important point is, where are the most likely places to find well-preserved microbes [on Mars]?" The Atacama Desert is such an ideal analogy for Mars that it is becoming a somewhat popular location for researchers. Davila has been coming to the Atacama for 10 years, where he studies what happens to microbes when water is almost entirely absent. In the driest parts of the Atacama, average yearly rainfall is sometimes less than 0.0393 inches (1 mm). 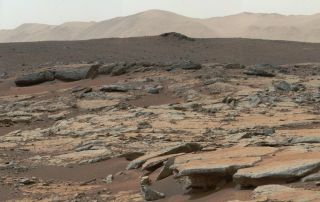 In the Yungay region, scientists from the Blue Marble Space Institute of Science in Seattle found that the atmosphere and soil have the same relative humidity as a spot in Mars' Gale Crater, based on measurements taken by the Mars Science Laboratory. And yet, in that Martian-like strip of land, which appears to feature nothing but dirt and boulders, the scientists from the Blue Marble Institute found bacterial species hanging on to life. One of the things scientists like Davila have found while studying life in the desert is that when water slowly leaves an environment, dirt and soil that are directly exposed to the sun can't hold on to moisture for very long, quickly making it uninhabitable. When the two Viking landers plopped down on the surface of Mars in 1976, they began — understandably — scooping up dirt and looking for signs of microbial life. "According to our model, that was bound to fail," Davila said. "Because dirt would be the first place that microbes wouldn't go in a very dry environment." As precipitation in a region begins to disappear, life-forms that once dotted the landscape will become sparse and less diverse until only the communities that are most well adapted are left, Davila said. These microbes will retreat from places directly exposed to the sun, and take shelter on the underside of rocks, where the moisture can hang around slightly longer. Semi-transparent quartz rocks are ideal, because some sunlight gets through to feed the microbes. "There are places in the Atacama where quartz rocks are colonized but there is no evidence of colonization in the soils," Davila said. "But we also see places in the Atacama where even the quartz is not colonized. […] Where even the survival strategies in rock substrates don't function anymore. They fail." The driest regions of the Atacama, the Gobi desert, and Antarctica (which is also being used as a Mars analogue) are at the so-called "dry edge of habitability," or the boundary beyond which there is no evidence that life can survive. Just before some microbial communities are pushed over this edge, they resort to one last trick: taking up residence in salt substrates or brines that extract water from the humidity in the atmosphere. Salt compounds like sodium chloride can pump water out of the atmosphere in a process called deliquescence (this is different from condensation, the process responsible for turning humidity in the air into liquid water on the outside of a cold glass). Microbes have been found living inside large deposits of sodium chloride in the Atacama, staying alive using the moisture the salt extracts from the atmosphere. It's important to note that while these resourceful microbes are surviving, they are not thriving. These communities have low genetic diversity, meaning they are reproducing very little. The microbes aren't optimized for these environments, but they have managed to not die. If these kinds of life-forms were found on Mars, it wouldn't necessarily be representative of what Martian life was like before the rivers and lakes dried up. None the less, the paper by Davila and Shulze-Makuch brings together a large body of evidence to make the cohesive argument that if life formed in the watery environments on Mars, there's a good chance they also lived on land. If those land-based life-forms found ways to adapt long after liquid water stopped flowing on the Martian surface, then Davila and his coauthors say scientists should go looking for evidence of those types of life on Mars. Davila said he and his colleagues are now doing work to that could help guide these searches and provide a better idea of where evidence of these last life-forms on Mars might be found. For example, Mars rovers could look for large patches of salt substrates, or translucent rocks, like quartz. "I think one of the important messages of this paper is that we might be missing opportunities by focusing entirely on ancient habitable aquatic environments," Davila said. "I'm not saying we shouldn’t do that, but we should consider alternatives as well."